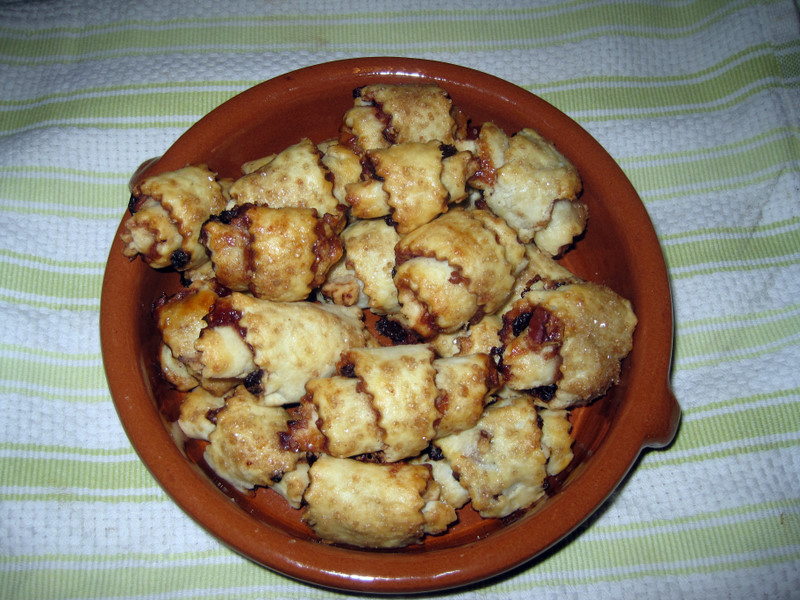 Rugelach should not be eaten only on Hanukkah. I was a bit impatient when making these little cookies, so I put the dough in the freezer for 10 minutes instead of letting it sit in the fridge for the prescribed amount of time. Try to be more patient than me because waiting will make the dough a lot easier to roll out. Either way, the end result will be delicious! 1. For the dough, combine cream cheese, butter, flour, and salt in food processor. Pulse until large crumbles form, just before dough sticks together into one ball. Remove dough from processor and form into two balls. Flatten each ball into a disk and cover with plastic wrap. Refrigerate for at least 2 hours, or up to 1 day. 2. For the filling, heat jam in saucepan until it becomes a thin liquid. Mix cinnamon and sugar. 3. Roll one disk out on floured surface until it is an 11-inch circle. With a pastry wheel or knife, cut the dough into 16 equal wedges. Brush a thin layer of jam on top of dough. Sprinkle dough with half the cinnamon sugar, half the pecans, and half the currants. Starting at the base, roll up each wedge. Place cookies on baking sheet, with tips facing down. Repeat process with second disk of dough. Refrigerate cookies for 30 minutes. 5. To glaze, whisk egg and water together. Brush over cookies and sprinkle with course sugar. 6. Bake for 25 minutes at 350º F.
I’ve been eating rugelach for 24 years and these are arguably the least dense ones I’ve ever had. Perhaps that’s why I gobbled down 10?